The nose is slightly spicy with hints of coriander and hazelnut notes. A slight eucalyptus/mentholated juniper note lies just beneath that, but seems to be squarely out of the foreground. As the top notes fade, there’s notes of unripe fruit and a slightly greener note. The palate is Juniper, crisply at first, warming with peppery, cubeb laced mid-palate. The juniper segues wonderfully into the minty note on the finish. A true Australian Gin experience! 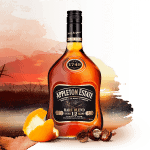 A smooth rich spirit with soft aromas of aniseed, a toasty grainy flavour of finest wheat, and a long, lingering finish with a hint of sweetness. Bacardi Superior is clear in colour, smooth in taste and dry in flavour with impressions of vanilla and subtle aromas of almonds and tropical fruits….. Its finish is dry and smooth.